Today’s headlines could make even the most optimistic person – like me – a little weary. But, my optimism was restored recently when I was invited to a screening of the new documentary about the 50-year anniversary of “Mister Rogers’ Neighborhood” called “Won’t You Be My Neighbor,” and it transported me back to my childhood. Mr. Rogers made it cool to have an imagination. He also addressed the tough subjects of the day, such as race and assassination. My favorite part of the film was about an early episode of “Mister Rogers’ Neighborhood,” in which King Friday, the ruler of the Neighborhood of Make-Believe, decided to build a wall around his kingdom because of his fear of change. Mr. Rogers explained that building walls – literally and figuratively – is an easy solution when you are scared. But, those who have courage find ways to join with friends and make new friends to develop solutions that bring the neighborhood together. This meaningful scene provides a simple answer to a complex issue in our often polarized world. One of my favorite quotes comes from Mr. Rogers. He said, “We live in a world in which we need to share responsibility. It’s easy to say. ‘It’s not my child, not my community, not my world, not my problem.’ Then there are those who see the need and respond. I consider those people my heroes.” This belief is one of the reasons I feel at home in the social sector – I’m surrounded by courageous heroes. One way nonprofits can be courageous is by finding new and better ways to tear down their walls and maximize operational efficiencies through collaboration. Along the spectrum between self-contained organizations that house every functional department and those that merge with other organizations lie organizational models to collaborate in ways that increase efficiency and maximize impact. One of these models is shared services. Shared services are much like outsourcing in that nonprofit organizations contract with other entities to provide specific services; however, shared services have the added dimension of clustering similar organizations to capitalize on synergies from collaboration. Additionally, shared services help nonprofits create, as Mr. McFeely would say, “speedier delivery” to their clients. Sharing Physical Resources: Some nonprofits have shared physical space to increase operational efficiency. The Children and Family Services Center of Charlotte (CFSC) and the Nonprofit Innovation Center (NIC) at the Sierra Health Foundation are great examples of this type of collaboration. Nine North Carolina nonprofit organizations saved a combined $1 million a year and continued to pay below-market-rate rents for occupancy and a host of other services, simply by locating in the same building. NIC’s health-focused agencies realized benefits from increased information-sharing and reported a significant increase in pride because their clients had professional environments to visit. 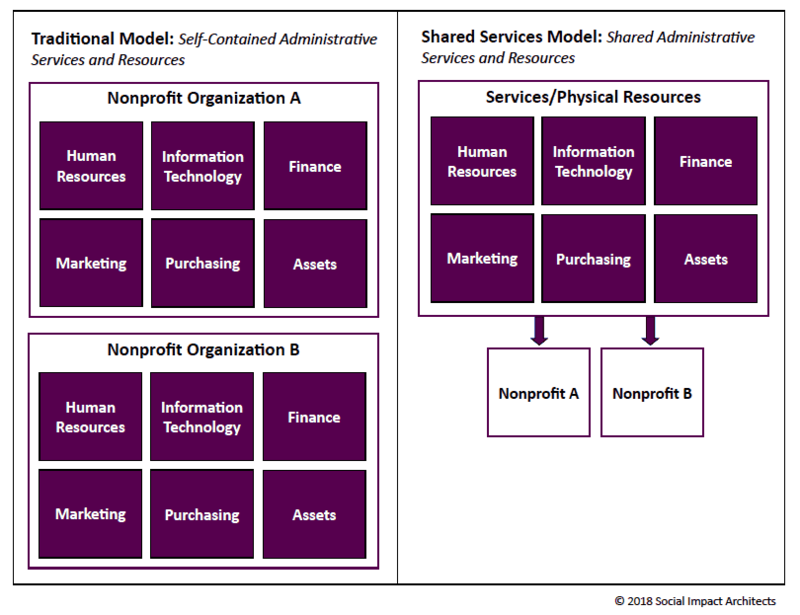 Sharing Services: Other nonprofits have come together to share administrative services like information technology, finance, human resources and marketing in order to realize similar efficiencies. Community Service Partners (CSP) serves six nonprofits that work with individuals with disabilities in Chicago. In the first year of this collaboration, all the nonprofits in CSP integrated the same information technology platform, which saved $100,000, plus an additional $96,000 from other efficiencies. CSP is on track to realize $3 million in savings over the next five years, and all members have already doubled their return on investment. Enlist a third-party to facilitate the process: Having a neutral third-party that has no affiliation with any of the organizations helps facilitate honest conversation about each organization’s commitment to shared services, capacity, responsibilities and concerns. We recommend conducting a feasibility assessment, which objectively reviews the options, and ends with a go/no-go decision. Find a lead funder to subsidize start-up costs: A vast majority of the shared service collaborations in the nonprofit sector have a lead funder that subsidizes the start-up costs. Shared services collaborations come in many forms and have diverse financial models – some utilize excess capacity of one organization, some form a cooperative, and others hire an intermediary to provide services. Build a robust financial model to assess the viability of cost savings: Ensuring that the collaboration will generate savings requires a robust financial model that includes a realistic estimation of start-up as well as ongoing operating costs. It may take two to three years to realize savings, and that often requires a critical mass, so it is important that the model includes the number of nonprofit participants the collaboration needs to reach that critical mass. Shared services can be a great way for smaller nonprofits to reap the benefits of larger institutional players in the sector while achieving savings they can reinvest in the programs that help those they serve. 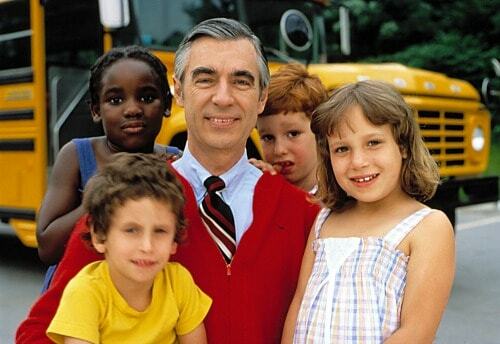 We are confident that Mr. Rogers would endorse shared services and say, “It’s a good feeling when you are able to find people that like to play the kind of things you like to play. It helps to make friends – playing together.” Shared services help nonprofits play and stay together and find new walls to break down together. We would love to hear your ideas and experiences on shared services and any practical insights you have gained along the way.